I read today that the world's oldest-living person died. The Brazilian woman was closing in on 115 years. The new oldest living person is Besse Cooper, 114 years, 299 days of Monroe, Ga.
Connie Marrero is the world's oldest living Major Leaguer. 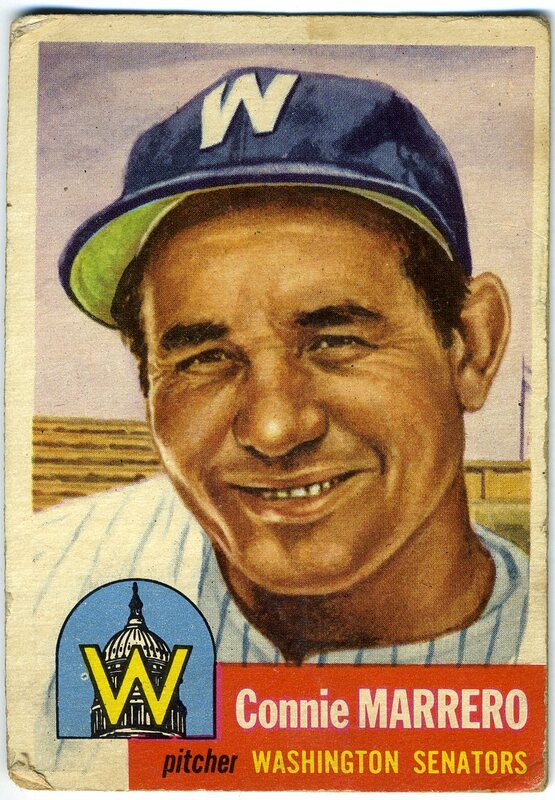 While the back of this card says Marerro was born on May 1, 1915, his real birthday is April 25, 1911. That makes him 100 years, 1 month, 27 days. 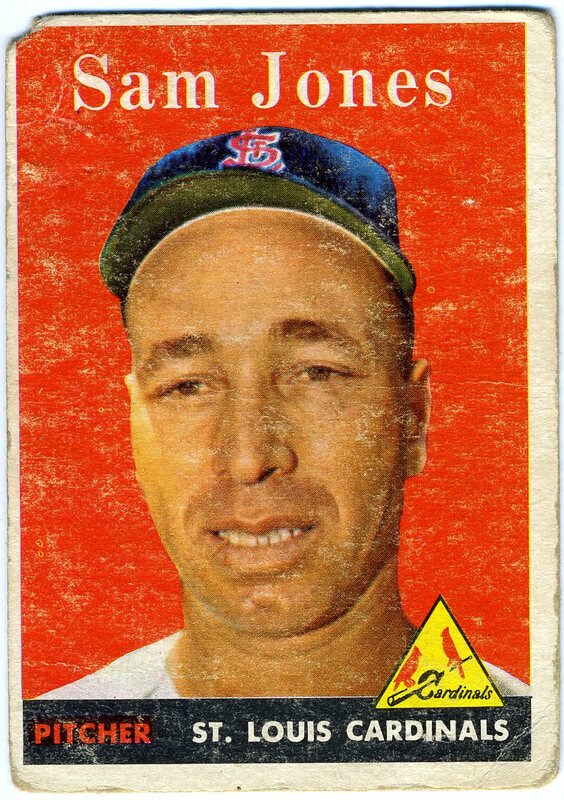 Marrero made his Major League debut in 1950, a few days shy of his 39th birthday. Before that, he played for years in Cuba. I guess those four years made a difference for the Washington Senators. A 35-year-old rookie is one thing, but 39? • Distributed in Roxbury, Mass. I also know that they are fairly rare.This is the first one I've ever held in my hands. It is also in horrible shape. I think this one was at one time part of a larger quilt. You can still see some of the thread. It's also missing part of its left side. Still a great poor old baseball card. Okay, so it's not technically a baseball card, but you can't deny that it's pretty cool. It's called "The Great American Baseball Card Flipping, Trading and Bubble Gum Book." And on page 45, a 1958 Topps Sad Sam Jones. I first saw the card when I was a kid, I knew some day I would have it. Even though he looked so sad, he made me smile. It's not like it's a particularly expensive card. And it's not like I didn't try to get one before this beauty arrived in the mail yesterday. 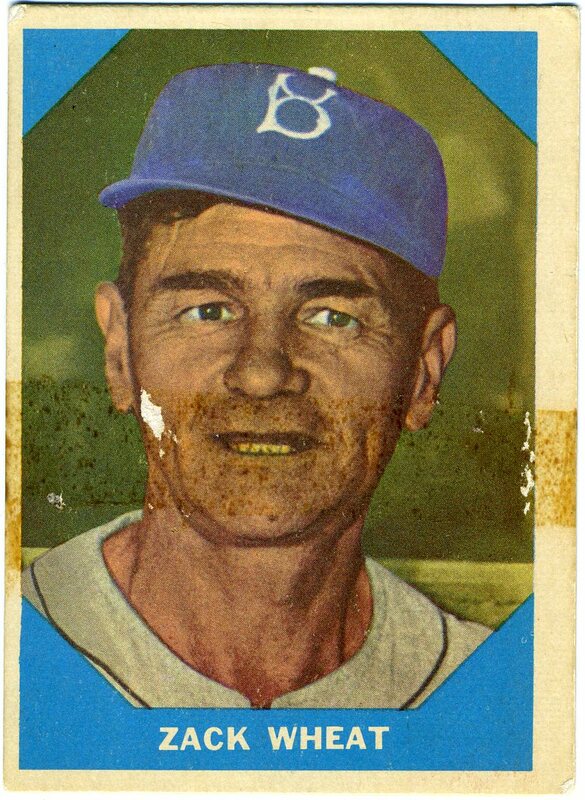 A few years back I walked into my Local Baseball Card Shop and asked the clerk if he had a 1958 card of Sad Sam Jones. I know he was thinking: who? But he directed me to a box of late-50s commons. After searching for a few minutes, I found good ol' Sam. It was probably in worse condition than this card. I asked the clerk, "How much?" He looked into a price guide and said something to the effect of $15. I almost choked. Needless to say, I didn't get Sad Sam that day. And then I got to thinking: When is the next time someone is going to walk into this store and ask for a 1958 Topps Sam Jones? Answer: Never. And so I bet Sam is still sitting in that box of commons. I'm sure he'll be there forever. I don't think I ever went back to that shop for a baseball card again. Fifteen dollars? Are you kidding me. By the way, this card cost me $1 on eBay. Overpriced? Some may say so. But at least it didn't make me lose my lunch. Do you ever buy a card on eBay only to find the shipping cost is more than the card itself? It happens to me all the time. Lately, I've tried to find a few other cards from the same seller in order to cut down on the price of the card. Does that make sense? In other words, I buy multiple cards from the same buyer taking advantage of combined shipping. This card is one of those. It was $.25 but the shipping was $3. So I added a 1960 Rookie Star Julio Navarro for $.01, a 1960 Topps Joe Cunningham for $.01, a 1960 Topps Rookie Star Frank Howard for $1.50 and a 1960 Topps Harry Simpson for $.15. Total cost with shipping $4.92. This is my first 1960 Fleer card and I'm not all that thrilled with its design. It' just plain terrible. But that big piece of tape residue makes it worth while. It's the little things that make a poor old baseball card.